A trip out to the West Coast. A trip that will reunite Eagle fans with a familiar face at LB. Remember last year when our LB group actually had a veteran presence. The wise old vet was Takeo Spikes. And it looks like the man still has some good playing left in that aging body. Spikes has settled in nicely with the 49ers, securing himself a starting position with his recent dominanting play. Five games into the season Spikes has posted 33 tackles, 2 interceptions, and a forced fumble. Very nice Mr. Spikes. 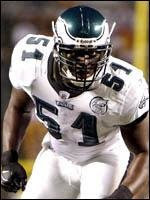 Not that the Eagles are weak at the LB spot, but I still think that for a few million the Eagles would have been wise to keep Spike's veteran presence on the team for one more year. It would of been a better option than the failed Rocky Boiman experiment (who is still without a team in 2008). Hell, maybe Spikes could of even covered an opposing TE!